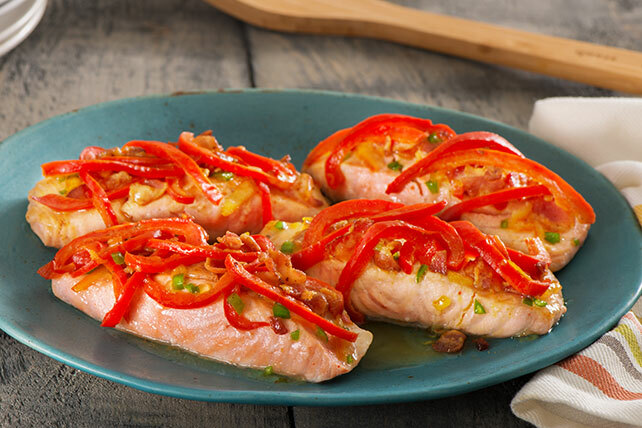 Topped with beautiful strips of red pepper, this skillet-cooked salmon is sweet and spicy—and serves eight! Mix marmalade, 2 Tbsp. of the dressing and the chiles; cover and set aside. Pour remaining dressing over fish in resealable plastic bag; seal bag. Turn bag over several times to evenly coat fish with dressing. Refrigerate 20 min. to marinate. Remove fish from marinade; discard bag and marinade. Place fish in medium skillet; cook on medium heat 5 min. on each side or until fish flakes easily with fork, brushing occasionally with 2 Tbsp. of the marmalade mixture. Transfer fish to serving plate; cover to keep warm. Add bacon to same skillet; cook 8 min. or until crisp, stirring occasionally. Add peppers; cook and stir 3 min. or until crisp-tender. Stir in remaining marmalade mixture. Spoon over fish. Serrano-Orange Glazed Salmon Pasta: Use 2 leftover cooked salmon fillets from Serrano-Orange Glazed Salmon. Cook 12 oz. spaghetti as directed on package. Meanwhile, flake the cooked salmon with two forks; set aside. Cut 6 slices OSCAR MAYER Bacon into 1-inch pieces; place in large skillet. Cook on medium-high heat 8 min. or until bacon is almost crisp. Add salmon, 1 cup coarsely chopped red onions, 1 chopped chipotle pepper and 8 chopped large pimento-stuffed green olives; cook and stir 8 min. or until onions are tender and mixture is heated through. Drain pasta; place in large bowl. Add fish mixture and 2 Tbsp. chopped cilantro; mix lightly. Sprinkle with 2 Tbsp. KRAFT Grated Parmesan Cheese. Makes 6 servings. Serve with an ice-cold glass of fat-free milk and side salad to round out the meal.